Denver Charter Bus Company has efficient and reliable wedding transportation for every step of your special day. From the bachelor and bachelorette party to the rehearsal dinner and day of the actual ceremony, we’ll be sure all transportation is taken care of for your guests. You can rely on Denver Charter Bus Company for charter bus and minibus shuttles on your special day. Every guest will travel comfortably to your beautiful service in a modern motorcoach driven by a professional driver. We’ll be sure the transportation logistics are covered so you can focus on planning other vital parts of your day. Our rental representatives will happily provide a free quote for your wedding transportation when you call us at (303) 495-2341. Keep your wedding day running smoothly with a personalized shuttle service. We’ll book a minibus just for you to help keep guests from running between your hotel, ceremony, and reception space. Guests won’t need to worry about walking long distances, finding parking, or getting lost in the whirlwind of the big day. Every bus rented from our service includes a local, professional driver. So once the night wraps up, everyone can also enjoy a designated driver to ensure safe travels back to your hotel. Each guest can enjoy your wedding day to the fullest with adult beverages and a great time, we’ll be sure everyone arrives back to lodging arrangements safely. When you rent with Denver Charter Bus Company, you can request an all-black or all-white bus to match your wedding decor. Renting a sleek charter bus will make your guests feel like VIPs as they’re shuttled to and from your venue. They’ll enjoy additional interior amenities like plush seating, WiFi, power outlets, lots of space to move around, and more to help all guests ride comfortably. Have a few drinks, listen to music, or just enjoy each other’s company on the way to the ceremony and reception. Need help getting around at your bachelor or bachelorette party? Book a private minibus to ensure safe travels throughout the night. Your personal driver will be your DD while you bar-hop and dance the night away in hip neighborhoods like LoDo or RiNo. Explore some of the best drinks and bites in Denver to celebrate before the big day. Want to drive in out-of-town guests to avoid expensive airfare? We’ll send a bus to pick them up from any predetermined location, making it easy for everyone to travel to your big day. Not only will your guests appreciate having organized transportation but they’ll appreciate the amount of thought put into keeping them comfortable. We work with a large enough network of charter buses to accommodate weddings of all sizes anywhere in Denver. If you’re hosting a luxurious wedding with hundreds of guests, we’ll build you a custom fleet of full-sized charter buses to transport guests to your venue. Guests attending large weddings may have an issue finding parking accommodations, especially at venues in busy downtown Denver locations. You’ll have a dedicated team of drivers to take care of your guests’ transportation. 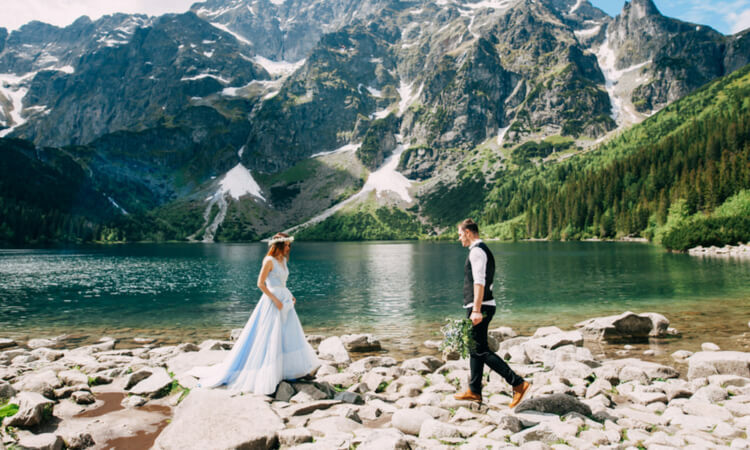 More intimate weddings taking place in one of the area’s many picturesque mountain venues would be better suited with a minibus to shuttle guests to your ceremony. With a private shuttle, your guests won't struggle to navigate mountain roads while trying to find your venue. Denver Charter Bus Company is here to provide transportation solutions for events and groups of all types in the Mile High City. We have experience serving a variety of wedding events with premier charter bus transportation. Call us today at (303) 495-2341 to chat with a rental expert and learn more about how we can help make your wedding day unforgettable.